Neighbors from across Rochester united in the Kutzky Park neighborhood this weekend for the second year of Porchfest, an event that partners local musicians with area homeowners who offer up their porches, decks, and lawns for the artists to perform. Rochester’s inaugural Porchfest took place last fall and attracted nearly 300 attendees. This year’s event drew even greater crowds, with initial estimates at over 400, according to event organizer and Kutzky Park Neighborhood Association president, Jesse Welsh. Fifteen musicians played at thirteen homes throughout the afternoon, and Welsh said some homeowners went above and beyond to draw in friends and neighbors. One couple had just moved into Kutzky Park less than six months ago, she says, but they loved the idea so much they took it the extra mile. With the rapid population growth predicted for Rochester over the coming years, DMC and other community leaders appreciate the need to channel days gone by and rekindle the sense of fellowship that existed among neighbors before smartphones and Wi-Fi became the norm. In 2007, a group of Ithaca, New York residents started a local festival to bring back a sense of unity to their community and celebrate local musicians. They launched the first “Porchfest,” an event that partnered local musical talent with area homeowners who provided porches, decks, and lawns where the artists could perform. Since that first event ten years ago, similar events have sprung up in cities all around the nation. 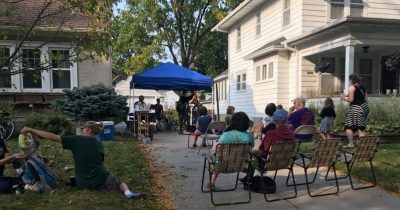 Rochester’s first Porchfest took place in the Kutzky Park neighborhood last fall when 12 hosts invited local musicians to perform outside their homes. More than 300 people attended the city’s inaugural event, and organizers are looking forward to an even greater turnout for Porchfest 2017, scheduled for Saturday, September 16. 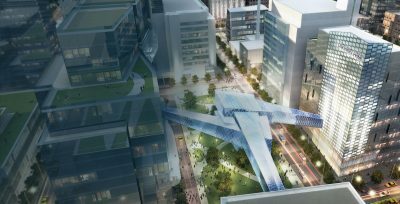 ROCHESTER, Minn. (July 27, 2017) – The Destination Medical Center Corporation (DMCC) Board of Directors voted to approve the $35 million Mortenson project in the Discovery Square sub-district under the DMC Development Plan. The building is one in a series of DMC projects in the sub-district. The project will receive $4.9 million in DMC tax-increment financing. The DMC vision is progressing as each of the sub-district’s distinctive personalities is beginning to evolve. Heart of the City, for example, serves as the place where health care intersects with hospitality and retail, the Downtown Waterfront looks to transform the perception of Rochester from a medical campus into a vibrant destination, and St. Marys Place becomes a monumental gateway at one of the primary entry points into Rochester. Lately, though, it’s Discovery Square that’s making the news. ROCHESTER, Minn. (Feb. 8, 2017) – Highlighting the growing momentum of the Destination Medical Center initiative, the DMCC Board of Directors today approved a $38 million mixed-used development project. The development would bring 156 market-rate apartments, retail shopping, public parking and pedestrian access to downtown Rochester. The DMC vision is not one that can be accomplished alone – or overnight. 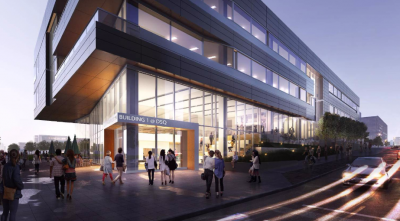 But with the advancements that took place on the DMC Development Plan over the past year, Rochester is well on its way to becoming a premier global medical destination. It doesn’t take an urban planner to recognize the qualities it takes for a city to be successful. DMC is in the middle of it all: growth, investment, culture, community, innovation… the list goes on. And Rochester is hitting the mark on each attribute, ensuring 2017 will be another year of success. Growth: A map on the DMC website highlights the fourteen projects currently in various stages of development in the DMC district, including the Alatus Development Project in St Marys Place (#14), the Titan-OPUS Project in Discovery Square (#3), and the Lofts at Mayo Park in the downtown Waterfront (#9), just to name a few. Investment: Private investment gained significant momentum during 2016 that put DMC on course to reach the $200 million threshold that unlocks $585 million in public funds spanning over 20 years. 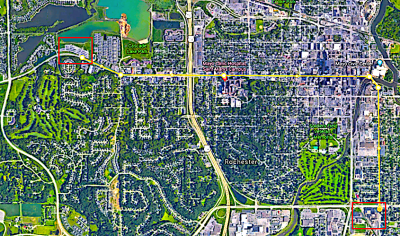 The Alatus Development project will add over 347 residential units, restaurant, commercial, and retail space. Project highlights growing momentum of Destination Medical Center initiative, with over $200 million in development since 2013. ROCHESTER, Minn. (Dec. 15, 2016) – The Destination Medical Center Corporation (DMCC) Board of Directors today approved the $115 million Alatus LLC 2nd Street Development Project for the DMC St. Marys Place sub-district subject to a final review of the project’s financing. The 13-story mixed-use development is expected to include over 347 residential units, 13,500 square feet of ground floor retail space, and 7,500 square feet of second-floor office and retail space. ROCHESTER, Minn. (Oct. 27, 2016) – The Destination Medical Center Corporation (DMCC) Board of Directors today received a preliminary view of two significant mixed-use project proposals aimed at building hotel, retail, and residential housing options in key sub-districts within the DMC District. Board members also received an update regarding transportation planning efforts and approved the DMCC’s funding request for 2017. Titan Real Estate and Investments and the Opus Group provided initial background on a proposed 156-unit apartment complex that would be built in the Discovery Square district upon a First Ave. surface parking lot. The development would include retail and parking within, as well as a green roof and pedestrian access to downtown. Titan, a local company, was the developer of “Broadway at Center,” one of two DMC-approved projects. The DMC sub-district known as St. Marys Place has received a great deal of attention of late. With several new development projects under consideration or in the works, DMC needs your help. Several months ago, in collaboration with the City of Rochester and a team of stakeholders, DMC began a design process for the public realm and infrastructure for the area and the 2nd Street Corridor. The process began by assembling and analyzing existing and new data. 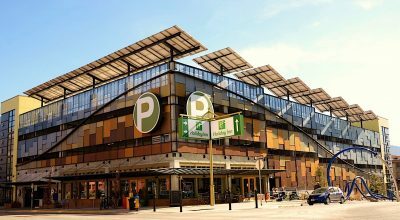 This served as the foundation for a recent “Design Sprint,” which involved three teams of stakeholders who were asked to explore and develop concepts to address design issues, such as transportation, parking, commercial districts, and neighborhood connections. Each team took on a different point of view for design considerations. One group took on the perspective of patients, visitors, and St. Marys employees; another, adjacent business and property owners; and the third, nearby neighborhoods.